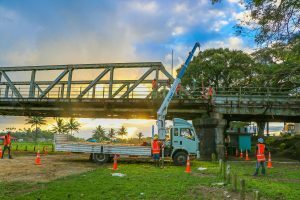 The fence installation on the new Rewa Bridge is running behind schedule as some of the materials had to be ordered from an overseas supplier to meet the demand of fitting a pedestrian fence across one side of the 680 meter long Rewa Bridge. Fiji Roads Authority Acting Chief Executive Officer, Robert Sen says that despite FRA’s best efforts to hurry along the procurement and production, the fencing work has only just commenced. Mr Sen says that the supplier has been working behind the scenes to fabricate these fences and had to order more steel for the vertical support frames from an overseas supplier. Mr Sen also said that the contractor can carry out his work without interruption during the two week school holiday period. Whilst the fencing work is commencing on the new bridge, the old bridge has also undergone transformation to prevent the public from using it. Hazardous concrete slabs on the footpaths of the old Rewa Bridge are being dismantled following the permanent closure of the bridge to pedestrians. FHH Project Engineer, Arsheel Mohammed, said that the old bridge, which continued to be used by pedestrians since its closure to traffic, had showed signs of severe deterioration due to lack of maintenance. “While the closure has eliminated the risks of using the old bridge, we identified that weak concrete slabs on the structure were likely to endanger members of the public if they broke and fell, particularly on the Nausori-end of the bridge where a park is situated,” Mr Mohammed said. To remedy this risk, approximately 100 metres of the concrete panels have so far been removed from both ends of the bridge. “We used a crane to lift the panels off the structure and safely onto the ground, after which they were transported to a depot nearby for storage,” he said. For the sake of public safety, a steel mesh fence will be erected to seal off hazardous areas beneath the bridge on the Nausori-end of the river. Fulton Hogan Hiways (FHH) is contracted by the Fiji Roads Authority (FRA) to improve road access across the Central, Northern and Eastern divisions.